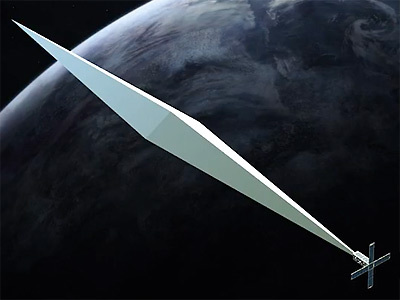 Orbital Reflector is a 3U CubeSat which deploys a large reflective sculpture. Orbital Reflector is a project by the Nevada Museum of Art and artist Trevor Paglen to put a reflective, nonfunctional satellite into low Earth orbit. Orbital Reflector is a 30 m sculpture constructed of a lightweight material similar to Mylar. It is housed in a small box-like infrastructure known as a CubeSat and launched into space aboard a rocket. Once in low Earth orbit at a distance of about 575 kilometers from Earth, the CubeSat opens and releases the sculpture, which self-inflates like a balloon. Sunlight reflects onto the sculpture making it visible from Earth with the naked eye — like a slowly moving artificial star as bright as a star in the Big Dipper. Global Western is an aerospace firm working with Trevor Paglen and the Nevada Museum of Art to design and manufacture Orbital Reflector. The satellite was launched on Spaceflight Industry's SSO-A multi-satellite launch on a Falcon-9 v1.2 (Block 5) rocket.